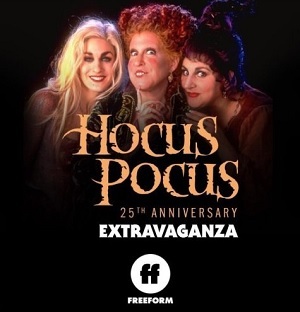 Freeform has announced that it will air “Hocus Pocus 25th Anniversary Halloween Bash,” an all-star party in honor of the cult classic film’s milestone anniversary. The 90-minute special, filmed at the iconic Hollywood Forever Cemetery to celebrate the movie’s status as a Halloween staple, will premiere on SATURDAY, OCTOBER 20th, at 8:15PM EDT/PDT as part of Freeform’s “31 Nights of Halloween” programming event. The night of October 20th will be full of bewitching fun as the network will also be airing a “Pop’n Knowledge” edition of “Hocus Pocus,” before and after the Bash at 6:05PM EDT/PDT and 9:45PM EDT/PDT. The special edition will celebrate everything about the iconic film and the fandom with a mix of trivia, funny observations and commentary around key moments and quotes. This “Pop’n Knowledge” version of “Hocus Pocus” is an experience no fan should miss! Freeform has expanded their annual Halloween programming event to “31 Nights of Halloween” bringing more thrills and chills to the entire month. From October 1st, the network will be invaded by everyone’s favorite witches, a murderous barber, out of control dinosaurs and everything else that goes bump in the night. “Hocus Pocus” will air throughout the most haunting stunt on television, as well as conclude the event with a day-long marathon featuring the Sanderson Sisters on October 31st.